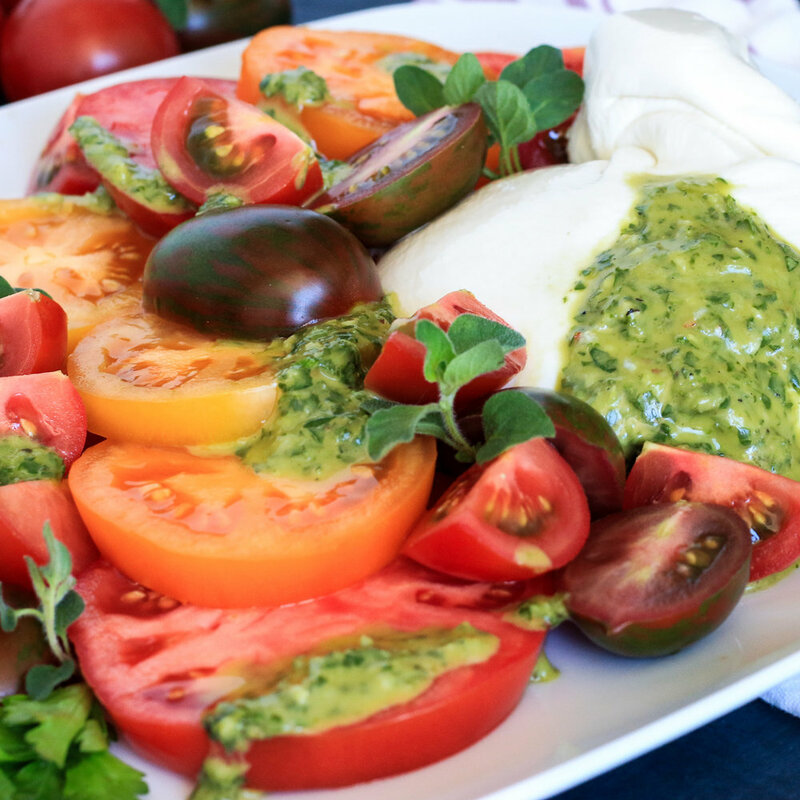 This is a twist on a classic Caprese salad. Chimichurri is an Argentinian sauce made of fresh parsley and garlic that is traditionally served with grilled meat. This dressing is fresh and vibrant with a serious punch of garlic. I think it’s great on anything but I also have an obsession with garlic. If you don’t want the intense garlic flavour tone it down by swapping out the fresh garlic with roasted garlic. Use leftover dressing on eggs in the morning, over roasted potatoes or even use it as a condiment in your sandwich. Burrata is an Italian cheese that is fresh mozzarella on the outside, encasing a creamy filling. If you can't find it at your local grocery store you can always swap it for fresh mozzarella instead. Slice the tomatoes into ½ inch thick rounds or bite-sized pieces. Blend all ingredients for the dressing in a food processor or with an immersion blender. Assemble by placing the burrata on the plate, surrounded by the sliced tomatoes. Drizzle the dressing over the salad, garnish with fresh oregano and season with salt and pepper.